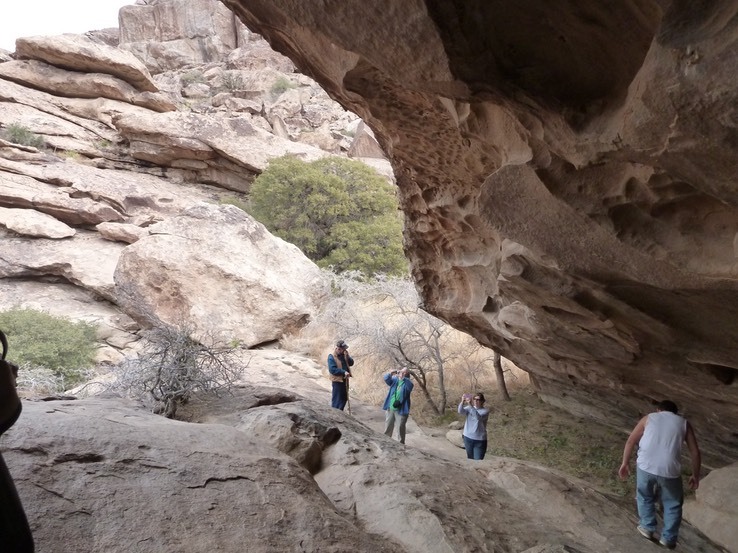 People have been coming to Hueco Tanks for at least 10,000 years. 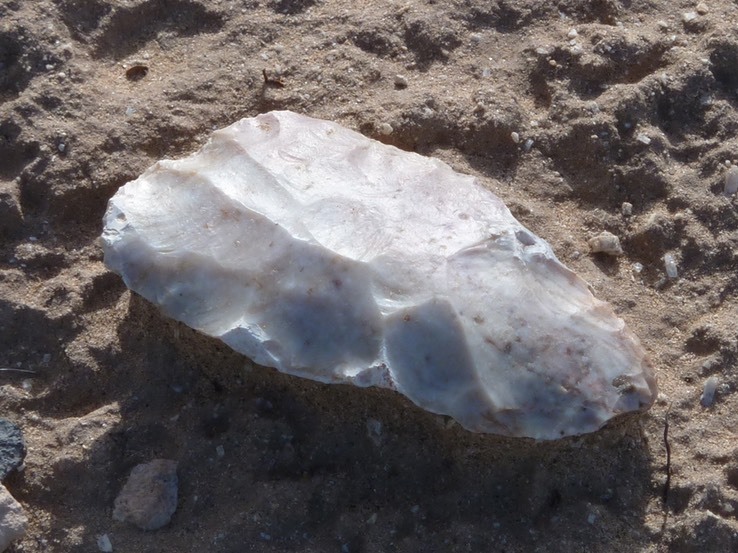 The earliest people, the Paleo Indians, were hunters whose presence has been identified by certain types of spear points and other tools. They left no pictographic evidence of their presence. They were present in the area between 10,000 BC and 6,000 BC. The climate at this time had warmer winters, cooler summers and much greater rainfall. The next group to inhabit the area were the archaic peoples. They left many pictographs, which tended to be geometric in nature; their pictographs are not representations of anything we would recognize. The Archaic period lasted from 6,000 BC to 200 AD. These people were hunters of big game, such as mammoths, and they used spears and atlatls (a type of spear thrower) to hunt. The final prehistoric group to inhabit the area were the Jornada Mogollon, who were present between 200 AD and about 1450 AD. This period is when the pottery known as El Paso brown ware appeared. The Jornada Mogollon became an agricultural society and had a village of pit houses within the area of the present-day park. They left a tremendous legacy of pictographs, including the largest known collection of mask paintings. The other figures that are recognizable as being from the Jornada Mogollon are the Tlaloc and Quetzalcoatl paintings. Tlaloc was a Central American rain and storm god. Quetzalcoatl was a god of diverse functions, including being the patron god of the Aztec priesthood, and of learning and knowledge. There are still people in this area who worship Central American gods and leave offerings by at least one of the depictions of Quetzalcoatl. Most of the Jornada Mogollon paintings had religious significance. There are several Native American tribes who spent time in the area during the historic period. One of these tribes is the Mescalero Apache, who used a lot of thick, white pigments in their paintings. The huge snake in Newspaper Cave (Site 17) is an example. The Kiowa also spent time in the area, and the pictographs clearly attributable to them are at what is known as the ‘Kiowa Siege Panel”. This is a long wall of paintings that commemorates the miraculous escape of a raiding party from a siege in 1839. They were trapped for 10 days without food and water by Mexican Soldiers after they found that there was nothing left in the area to steal. Based on their oral history, a group later returned to the exact area and did the commemorative painting. The last group who left imagery at Hueco Tanks is the Tigua of the Ysleta del Sur Pueblo. The sun shield in Comanche Cave is attributed to them, as well as quite a few of the names written in black, which can be found in several locations in the park. This photo was taken from inside Comanche Cave, a site which has been used by the Mescalero Apaches for their girls’ coming of age ceremonies. It also has a natural cistern that may hold as much as 13,000 gallons of water, and has been known to be completely dry only once. In 1858-1859 the Butterfield Overland Mail stage route ran through what is now the park. They had built a station there which has since disappeared. It is thought that the stage stop was near Newspaper Cave (Site 17), and that the ruins in front of the Interpretive Center are the remains of structures built with the rocks from the abandoned stage stop. In 1898 Silverio Escontrias purchased a large tract of land which included the 860 acres that is now the park. He used the land as a cattle ranch and built several of the dams on the property. The family owned the property between 1898 and 1956. Silverio and his wife raised eleven children in the ranch house, which now serves as the park’s Interpretive Center. The park lands were under other private ownership between 1956 and 1969. In the early 1960s developers built a drainage diversion system in an attempt to create a lake as part of a resort. The plan was that water skiing would be a resort activity. However, they failed to test the soil beforehand, and when they went to fill the lake they discovered that the water drained out as fast as they could pump it in. Unfortunately, in the process of trying to create this lake they destroyed a lot of archeological evidence. The property was obtained by the state of Texas in 1969 and the park was opened to the public in 1970. It was officially designated a State Archeological Landmark in 1983. The park site is still sacred to the Native American tribes who have history there. They still hold ceremonies there and some people still leave offerings for some of the gods represented in pictographs. Additional photos dealing with history and culture are included in the photo album.